Make the most of Mardi Gras with our 2 1/2" clip on medallion badge! This medallion badge is designed for quick and easy attachment to virtually any Mardi Gras beads. 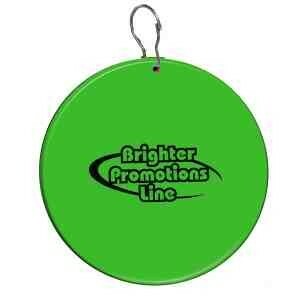 It's a great, festive promotional product for alcohol companies, bars, nightclubs, restaurants and more. Also makes a fun party favor for birthdays, weddings and other special occasions. Choking hazard, not for children under 3 years old. Order in increments of 1 dozen. Necklaces sold separately. Above pricing includes a 1 color imprint in 1 location. Please add a Set-up fee of $55 (v). When we print on a LABEL (circle shapes ONLY), we offer up to 4 spot colors (NOT PMS matches). Full Color Process Decal add $0.25 (v). Each additional spot color add a running charge of $.14 (v) per color, and a Set-up fee of $20 (v) . When we PAD PRINT, PMS matches ARE available. For each additional location and for each additional color add a Set-up fee of $55 (v) and a running charge of $.25 (v) per color, per location. Imprint Minimum is 200 pcs. Imprint Method: Pad Print or Label Only. Production Time: 5-10 business days after receipt of artwork and approval.